Very rarely will you see a treasure load of pay lines for 20p spin, but the Wild Seas slot from Elk Studios offers 178 ways to win per bet. 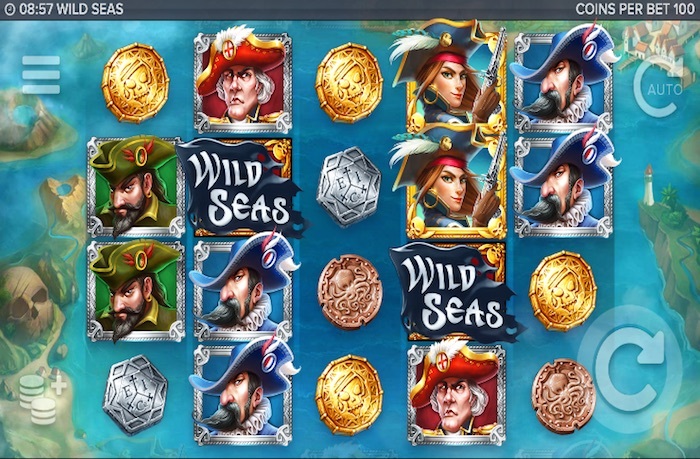 With a pirate theme and 4 rows of 5 reels set off coast Port Royale; this nautical online slot includes betting strategies, sticky wilds and sailing ships on a course for chartered wins! Wild Seas is just that, a sea full of Wilds. It’s a clever play on words, but that’s the long and short of it. Set in the tropical waters off Port Royale and with storms looming, the Wild Seas online slot is a 4 row 5 reels game with 178 pay lines. Playable from 20p to £100 a spin, the slot features a 96.3% RTP payout rate and a 1000 x coins jackpot. I know what you’re thinking! At 100 total coins per bet, that’s no big deal. But Wild Seas offers a total win of up to 178,000 coins, probably the games most compelling aspect. So what’s going on here? In a quick summary, you join infamous pirate Anne Bonny in one of the best new slots we’ve seen this year. On graphics the slot is second to none while travelling Wilds are put to good use in the games clever design. As its all about piracy and rewards, Wild Seas uses a cool multiple-level free spins bonus with cannon fire, sinking ships and captains treasure. Elk Studios also include betting strategies so players can attempt to improve their game with automatic betting adjustments depending on spin results. How much can you win playing the Wild Seas slot? With all new slot reviews we’re including how much can you win playing them? It’s a good question and while we can’t predict your particular game, we can offer some examples of what the pay table could offer. We do this for the lowest and highest spin you can play, in this case 20p and £100 a spin. Firstly, the Wild Seas slot offers 178 pay lines (ways to win), good right? But wait, you’re also betting 100 coins with every spin. Each bet is worth 100 coins and there’s 12 betting levels or values ranging from 20p to £100 maximum. So at 20p, each coin would be worth £0.002 and at £100, worth £1.00. So while there’s lots of ways to win, most of the prizes (without the bonus) could be small. Let’s take a look. If playing Wild Seas for 20p a spin (£0.002) coin value, you could win 20 x £0.002 = 4p for 3 bronze coins (lowest win). The highest pay line win of 1000 x £0.002 for 5 x Anne Bonny symbols would be £2.00, a prize of 10 x your 20p spin betting cost. Looking bigger (maximum win) and you could win up to 1,780 x your betting stake or 178,000 coins (another way of putting it) on every spin, which would be £356.00. High rollers on the other hand would see the following returns. Play the Wild Seas slot for £100 a spin and you would bet a coin value of £1.00 on each turn of the reels. The smallest win would be 20 x £1.00 = £20.00 while the jackpot would pay £1,000. A maximum win at this level would return £178,000. There’s no denying the pay table power of Wild Seas, in the upper half there’s scope for lots of rewards but the lower symbols return very little. Remember, at 100 coins per bet you need symbols that pay anything more than that, in this slot, that’s pirate symbols and bonus icons (wilds). If you’ve read our guide on everything about online slot features, you’ll know that features generate the biggest wins outside of the slots jackpot. Elk Studios Wild Seas is all about Wilds and using them to good effect. There are three that make up the games bonuses including Wild + Bonus, Sailing Wild and Sticky Wilds. In the game, these represent the bonus trigger, break the convoy bonus level 1 and loot the treasure bonus level 2. Unlike other Wild symbols that substitute all other symbols accept the bonus symbol, this is both. What I like about the Wild + Bonus is just that. Not only will this fill in gaps to help generate wins, but two of them will start the break the convoy bonus on level 1.
three Captains is now selected at random replacing all other Captains, the Ships will now sail as Break the Convoy begins. As the first level in the free spins game, Break the Convoy starts with 4 Ships on reel 5, that’s Ships top to bottom on that reel. Now following each free spin, the travelling wilds (Ships) will move one position left. Pirate Ships (I presume Anne Bonny) can now appear on reel 5 and fire cannons on the convoy (Ship on the same row as the Pirate Ship). One hit will hold back the travelling Wild for one spin (hold) while three hits will sink the travelling wild and reveal the Captains treasure. If you don’t sink a Ship before they reach reel one (travelling wilds get to first reel) then bonus level 1 will end. The name of the game is to plunder as much money from the fleeing convoy before the bonus ends or you make it to level 2. What I like about the Wild Seas Slot Free Spins Bonus is the two tiers. 20p slots don’t normally offer such depth and in this game you’re getting twice the effect if you can sink a Ship. If you sink at least one Ship during level 1, you’ll progress to level 2. What I get from this game is that any Ships sank in level 1 will turn into chest symbols. These can appear on reels 2, 3 or 4. Additionally, the chest symbol is wild and can appear on the reels during the free spins of the Loot the Treasure bonus. The chest symbol can substitute for all other symbols except the pirate ship or the barrel. Anne Bonny and her pirate ship can again appear on reel 5, this time firing the cannon if on the same line as a chest symbol. If cannon fire hits the chest symbol, that symbol will turn sticky wild, remaining in place for another free spin. But keep an eye on reel 1, if you get a barrel on the same row as the pirate ship, cannon fire will cause the barrel to explode and end bonus level 2. The Wild Seas Bonus Feature is a frenzy of wilds, using both travelling and sticky wilds against a set of free spins. As the bonus is multiple levels, there’s lots of opportunity for some big wins and the feature itself is enjoyable. As apposed to other new slots that integrate features vertically, this game incorporates horizontal strategy and it works well. I’m convinced it won’t help you win, what it does do is apply automatic betting reaction. Its common sense, if you’re betting big and not winning, you may have to reduce your bet. If you’re betting small and winning, you may want to increase your bet to try and win more money. The greed element! The betting strategies in the Wild Seas Slot include Optimizer, Leveller, Booster and Jumper. Sounds very scientific and technical, but they’re just automatic betting adjustments. I think they’re interesting and it puts another angle on your game, but I don’t think they can help. With each betting strategy resetting after a win or a loss, it’s all very much hocus pocus. While we get lots of new slot games from the big developers. I often prefer the slots that the smaller companies create. Wild Seas from Elk Studios proves me correct. If you’re looking to play online slots for 20p with up to 1,780 x your betting stake on every spin, why not set sail with Anne Bonny. With graphics and gameplay at their best, this nautical adventure promises not 1, but 2 possible hauls of big wins for the luckiest of spin farers! It’s a good game, with 12 betting levels and lots of pay lines, I’d stick to the betting level of £1 a spin (1p a coin) and avoid the Leveller and Booster betting strategies. I’ll also tell you that betting strategies don’t change the 96.3% RTP payout rate. Finally, good luck sinking Ships!